RAF Barkston Heath is located East of Barkston and the A607, South of Ancaster, about 6 miles North-East of Grantham in Lincolnshire. 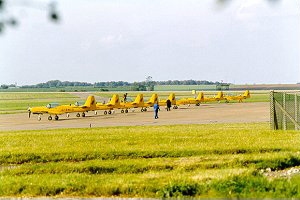 Barkston Heath is home to the Joint Elementary Flying Training School (JEFTS). 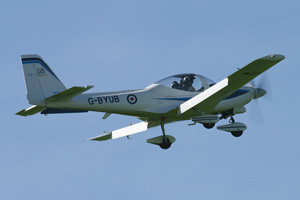 JEFTS is an MoD organisation comprised of 703 Naval Air Squadron and 674 Squadron Army Air Corps but the aircraft and some of the instructors are civilian, being run by Babcock PLC - the remainder being a mixture of pilots from the three branches of the forces. 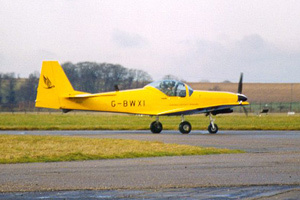 Barkston Heath is also a relief landing ground (RLG) for the nearby RAF Cranwell, and JEFTS come under the umbrella of the Cranwell-headquartered No.1 Elementary Flying Training School. Barkston Heath airfield itself is somewhat oversized for its modern day purpose; it originally opened in April 1941 as an RLG for a much busier RAF Cranwell, and then had hard runways laid in 1943/1944 in preparation for use as a heavy bomber station. However the USAAF moved in instead (USAAF Station 483) and the airfield became home to a variety of troop carrying units, taking part in the parachute drops supporting both D-Day and the ill-fated Arnhem operation. Used for surplus equipment storage after WWII, the airfield reopened as a Cranwell RLG in 1948 and also went on to house A Flight of 25 Squadron with their Bloodhound missiles from 1983 to 1989 (the missile site - minus missiles and launchers - is still mostly intact on the north-western side of the airfield and is occasionally used for training, simulating an Eastern European forward operating base). Most of the wartime buildings including some of the hangars have long since been demolished (particularly those around the old main entrance on the southern edge of the airfield). 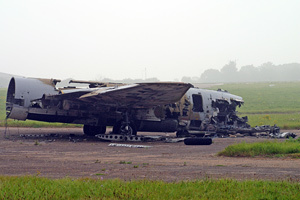 The hangar complex on the eastern side of the main road is no longer part of the airfield. The MoD Police would appreciate it if anyone spotting or viewing at Barkston would pop into the guardroom (between points D and E on the map below) to let them know what they are doing as a courtesy. If not, there is a good chance they will send somebody out to investigate, so you can save their time and yours by letting them know what you are doing in advance. Not a lot! 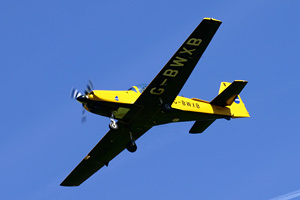 The JEFTS operate black and yellow Slingsby Fireflies, and that's mostly what you'll see here. Though it is a Cranwell RLG, don't expect to see anything other than the occasional overflight from a Cranwell-based aircraft. Activity is mostly office hours, weekdays and varies greatly in intensity; some people have seen little more than one Firefly bumbling around, but it can get very busy indeed (and this appears to be more usual). 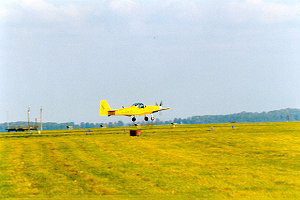 Any Fireflies not flying are normally parked up on the apron adjacent to the T2 hangar by the B6403 road. Assuming you're coming from Cranwell, you come off the A17 onto the B6403 and follow it South through Ancaster. A right-hand turn leads down to the area of the airfield used as a dump (A), where the rather sad remains of a Canberra moulder away. You can see aircraft on runway 24 from here but it's too far away for good photos, and is of little use for serials of stuff on the main apron. Sometimes aircraft in the 06/24 circuit bank over your head if you're parked further back along this lane (by the quarry), and you can try walking along the edge of the field here for another angle on the Canberra or to get closer to anything landing on 24. Back to the road and continue South, taking the first left. Just past the entrance to a paintball site is a good place to park (B), and you're now near the final approach path. While the airfield is out of site beyond the trees, this is the safest spot to park for pictures of aircraft on final approach to runway 24. You can of course walk back up the road and then turn left to walk down towards the airfield itself if you want to be able to see the runway. The trees behind you will mask anything approaching to land on 24, but you can cross the road for a better view. Aircraft taking off from 06 have normally turned away well before they get this far unfortunately, and any photo you can get of these will require a very large (600mm+) lens. Anything landing on 24 is within reach of a 300mm lens though. There is a small entrance way on the eastern side of the road here but there isn't much room to park and you'd be blocking the gate here - the cones indicate the landowner would prefer you didn't do this. Back to your car and return to the main road and turn left. Continue down the road for a bit past the end of runway 24. You'll see a crash gate on the right (C) and another entrance on the left. There's enough room either side of the crash gate to get away with parking for short periods here to get a photo of anything taxiing out to depart from 24. Anything landing on 24 is visible too, but from here it's a bit distant for good photos. - a 500mm lens may do for nice side-on shots. Just a little further down the road there's a similar crash gate (D) but this one's little use for photography. For logging serials it's similarly poor but you may be able to make out a parked Firefly or two from here. However for a clear view of the main apron all you have to do is walk down the verge for a bit, past the main entrance, and keep looking through the trees. There are a number of places where your view is unobstructed by buildings and you can see the line of aircraft clearly (e.g. E). There's another crash gate further down the road, and anywhere along the roadside from here to that point has a good view of the apron - though it's best in winter when the foliage is at a minimum. Back to the car and continue South on the road. You'll soon see the windsock on your right; just before you get to it there's a field entrance on your left (F). There's room for a car or two here and it's the only parking opportunity nearby if you want to get photos of aircraft on approach to runway 29 (or 36, though you'll be shooting into sun in the afternoon). Continue along the road and take the first turning on the right, and go down this small road. You'll pass the old main entrance to the station, on your right. Be aware that the local wildlife delight in wandering across this road in large packs so take it easy unless you particularly fancy roadkill for tea. You'll soon come to a place where the road curves to the left and there's a patch of grass on the right with a small track the other side of it. Pull in here (G) and you have a good view across to runway 06. Aircraft landing on runway 11 are still rather far away but a 400-500mm lens may get you a passable shot. The track leading West from this spot isn't suitable for motors according to the sign here, and sure enough it becomes pretty rough very quickly but it leads all the way to Barkston village, with a further track going North near the airfield perimeter. A walk up here to point H will put you in line with runway 11, though you're a bit distant so aircraft on approach will still be quite high. If you particularly fancy a walk, the track continues northwards to join a footpath which goes around the perimeter by the old Bloodhound missile site area of the station, but the viewing opportunities in this area are non-existent as you are so distant from the runways - all you may see is aircraft in the circuit above you, hundreds of feet away. The small scale of operations and civilian nature of the aircraft appear to contribute to a lack of any obvious MoD police patrols, but the local police are either very vigilant or very bored, as I saw several patrol cars during a brief visit. When turning in a field entrance one even passed and came back in the opposite direction a few seconds later complete with glaring stares from those onboard. Looks like an area to be very careful about parking, the state of your vehicle and your tax disc and insurance! Petrol/diesel and a few small shops available in Ancaster. RAF Cranwell is around 15 minutes' drive away, straight up the B6403 and turn left onto the A17. If you are into ancient history, Lincolnshire's "most significant pre-Roman ancient monument", an Iron Age hill fort/defended settlement lies close to the airfield, best reached from Honington village but also walkable from the tracks and footpath to the west of the airfield. It's not a tourist attraction so don't expect to see much more than raised earth ramparts, deep ditches and sheep! Contributors: author, Gary Watson, Neil Chavner, Tigger, Nick Challoner, Fighter Control forum.